My New Years Resolution for 2011 was to simplify, and I really feel like I've succeeded. My new house is clean and organized (most of the time) and I don't have too much extra clutter hanging around. So now it's December 1st, I'm almost ready for Christmas and am thinking about what kind of countdown to Christmas program I want to do. I mean there are advent Calendars, 12 Days of Christmas, etc and it's a great time to start thinking about a New Years Resolution for next year and get everything ready for the end of the year. My newest addiction is called Pinterest. It's basically a bunch of photo boards where you 'pin' links and ideas. You can steal ideas from your friends, or search for specific ones and pin them to your own boards. So of course I've found some great ideas on there and decided that a 21 Day Challenge would be perfect for the month of December. 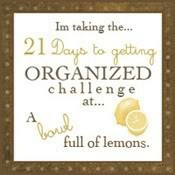 I'm borrowing this idea from a blog called 'A Bowl Full of Lemons'. I might post pictures of my progress, especially on the days where I make a lot of progress. And since there are 31 days in December, I might combine some days and get one task done all weekend, for example. Here are the daily tasks. Feel free to join in if you want. I hope to start the New Year with a clean, organized house. Lisa, sometimes I think that if we hadn't moved, I never would have gotten rid of all the stuff we did. It's a great starting point and an easy way to know what you can give away because you really have to go through everything. Good luck with your move!